During this time of remembrance, we should also take a moment to reflect on those brave mariners who perhaps did not join up to serve in the Forces, but continued to sail the ketches and schooners full of cargo round our coasts to keep the country working. Coal, wood, salt, clay, trade around the coast did not stop, could not stop! Aboard Bessie Ellen, loading and discharging cargo under Capt. Chichester carried on with son Jack as crew, and on Sunday August 4th while the ship was being towed from Kingsbridge to Par, war broke out. On reaching home soon after, papers were received calling Jack for military service. Capt John took the papers to the Customs house where he sent for the recruiting officer. After a strong argument, the Captain declared his son Jack indispensable and threw the papers back at the officer. Jack continued working aboard the vessel until Good Friday 1917 when he fell foul of the law for wrecking but that’s another story. The First World War had a mixed effect on West Country shipping. Until 1914, John Chichester always took the family on a summer cruise to Plymouth or Cowes, sometimes even France, but of course these excursions had to cease at the beginning of war. Memoirs of the period confirm that the extra demands of a war economy on the national transport system kept the vessels busy and freight rates high. A voyage record for 1917 for the ships covered by the Mutual Assurance Association shows that at least then, when unrestricted U-boat attacks were at their highest, the Braunton fleet was largely employed in the Irish Sea, with only a small number of the ships crossing the channel to France for the more lucrative cargos. Only two Braunton Schooners were lost that year. Several vessels were laid up probably due to crewing shortages and because of the shipping boom afterwards, many of them were not brought back into service. From that point, the vessel was laid up until March the following year whereafter she continued to trade in the Bristol Channel and the Cornish Coast. 20.09.15 Vessel Laid Up until April 1916. We would suggest winter weather and small crews could be the reason. 19.10.16 A. Cross shipped from Glasgow 142 tons Manure for Barnstaple, arriving 10 days later 29.11.16. Was this due to weather conditions so late in the year? During all this time, Bessie Ellen was under sail alone but sail had its drawbacks. Captain John traded to Goodhorne with clay on a regular contract, having a rendezvous with a steamer which visited London docks every three weeks. In late 1915, the bad weather made Bessie Ellen a day late so Captain John had to wait there three weeks for the steamers return. It was this that confirmed the decision to turn to auxiliary power. Today, the hull of the vessel is 85% of original timber. Well built ships and strong men continuing in a dangerous livelihood has meant that today we have a freedom and a continuing living heritage in both Bessie Ellen and Irene for us all to enjoy their history. Two Trading Ships Together for 2015! Exiting news. After a break of nearly 100 years, Bessie Ellen & Irene will be sailing together again next season. The operators of Bessie Ellen and Irene have got together and designed a fresh and variable sailing programme for both ships, offering everyone who love the sea and shore to get on the water in 2015. 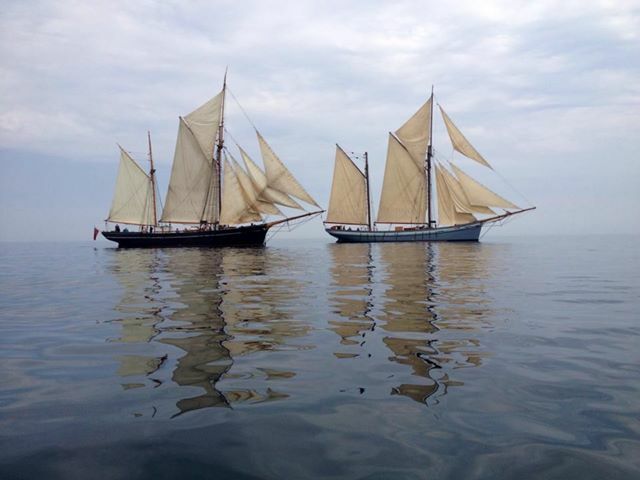 These two vessels are a pair of the last remaining examples of the schooners and ketches of the West Country, which in the latter part of the 19th century and up until the 1930’s carried cargo around the coasts of the United Kingdom and Europe. These sailing ships became the livelihood to many families of the small towns and villages in the South West, such as Par and Fowey, in Cornwall, Appledore, Bideford and Braunton on the Estuaries of the Taw and Torridge in North Devon. Not only did these towns supply excellent seamen and captains, shipyards grew up to build and maintain the large fleet, sail makers and blacksmiths for repairs, chandlers, brokers and merchants gathered to supply the ships with cargoes. In fact a large percentage of the community was somehow involved with sailing ships and the sea.From Scotland to Scilly, water and whisky, maritime festivals and fairs, these two ships from a period now long gone still survive to give us all a reminder of life at sea during the last great age of sail. From daysails in Cornwall, family holidays to Scilly or adventures to St Kilda, there is something for us all in this maritime nation! So, if you or a friend are itching to go, why not give us a call now or book a sail with these grand old ladies. Spring 2015 will see the launch of a crew training scheme aimed at young people who wish to learn all aspects of sailing, maintaining and the running of a large sailing vessel with a view to future employment in the maritime sector. With two ships in the fleet, Bessie Ellen and Irene, each original West Country Ketches, 4 training berths are available for a seven month placement commencing in March and ending in September. Training will take place aboard these working charter vessels both in the boatyard and at sea with charter voyages to Cornwall, Ireland and Scotland. Each placement will cost £8,000 and will include external courses, accommodation, wet weather gear& personal rigging kit. Meals and bedding are provided. Applicants should be aware that they will be joining in with the general running and maintaining of working ships and the undertaking of crew duties and responsibilities alongside the professional crew. On completion of the course, we will endeavour to find placements for you on tall ships across the world or entry into training colleges here in the UK to help get you started and further your career. If you have any queries or questions about the course, please feel free to contact us. * These courses are outsourced and are subject to time restraints and availability. Sitting in a gale in La Coruna has provided me with the time to sit down and publish next years sailing adventures and I truly hope that there will be something for both old salts and newcomers to experience both the ship and the fantastic ocean wildlife & coastlines. Scotland once again will feature for the majority of the summer, but next year you have the opportunity to visit Southern Brittany for some spring sunshine during the Semaine du Golfe in Morbihan. The Irish sea beckons with a number of trips passing from Scilly and beyond the North Channel andt this year we hope to repeat our visit to Rathlin and Giants Causeway. 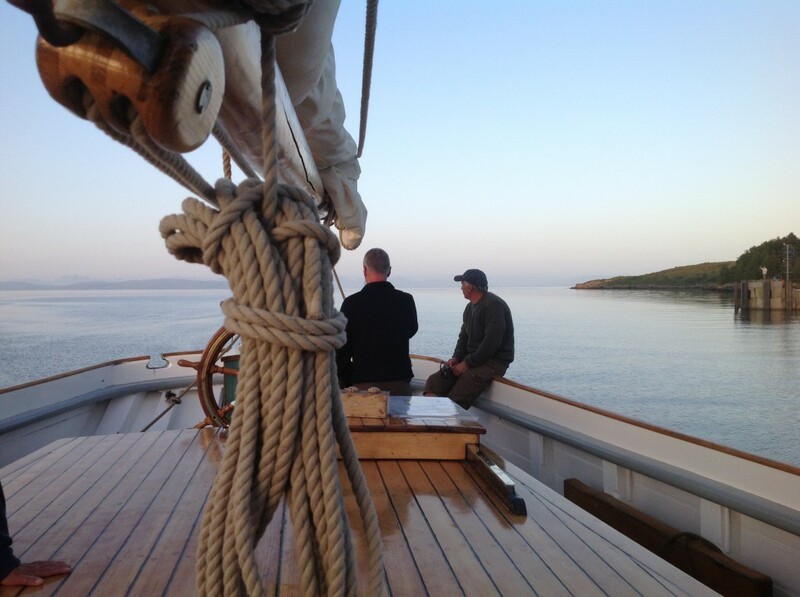 We have chosen to offer short and longer voyages again this year as the mix proved very popular last season. Whatever the choice, I am certain the wildlife will abound in the Isles of the West. We hope to provide you with an experience you will never forget, both on board and ashore, so give me a call if you would like to book or discuss which voyage is most suitable to your tastes. “What are you hoping to get out of this experience?” It’s a perfectly fair question, but not one I was altogether prepared to answer. I told Nikki, “Sailing experience, with an eye on a possible career change,” but I’m not certain that’s the full answer. The cuticles on all my fingers are torn up and streaked with dried blood. When I wash the heads, using a vinegar/water solution so I don’t damage the woodwork, the cuts burn. My muscles are sore, which isn’t surprising, considering I left a desk job to come aboard, but I’m an athlete and it’s been four days… Hopefully, my body will adjust to the climbing and squatting and pulling in the next few. On my first voyage we circumnavigated the Isle of Mull, exploring caves, viewing puffins, and tromping up to Gylen Castle, which has a grim history reminiscent of A Game of Thrones. That was tourism, though, and while those small trips were fun – in fact, they are the purpose for many visitors – those trips weren’t my purpose. This is a tour ship, but it’s also a living community, a century-old trading ship worked and maintained by a small crew. The experience of working a vessel is what I am here for, and despite the physical strain and the foibles of literally learning the ropes, I’m experiencing a sense of satisfaction that I haven’t in a long time. I can’t pronounce, much less spell, some of the knots I’m using: the bowline, clove hitch, reef knot, sheef (sp) shank (? ), and slip knot. We coil clockwise “halyards”, “lines”, and “sheets” – not “rope”. We lower the main sail “throat” first, followed by its “peak”. All these words, which I struggle to remember in a pinch, are becoming a part of my daily vocabulary. Aboard the Bessie Ellen, I am trading a comfortable office for sea spray and “dreek” Scottish weather; swapping the summer sunshine of my home in Istanbul for rain and fog and cold; and leaving behind the bustle of 23m people for a small boat with fewer than 20 passengers and crew, sailing remote islands that feel like they’re locked in the 19th century. It’s jolly good fun. Today will be the start of my second voyage with the Bessie Ellen. More learning and cleaning and work awaits. 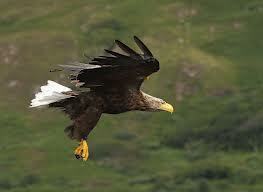 Tonight, we’re bound for Loch Buie, continuing our search for good wind to sail and eagles to watch. Sometime in the course of all this excitement, I hope to find an answer to Nikki’s question, but I get the feeling that I don’t need to be in a hurry to do so. Heading out again soon. Rain and thunder on the way, but it has been so hot here in Oban the last days. Looking at the forecast of South easterlies, we will take Loch Buie for eagles as an anchorage, before heading towards Islay again to pick up the cargo of Bruichladdich for Drogheda. Ballycastle and Rathlin are on the way and I hope to make it to Warren Point where Bessie Ellen used to trade years ago. See you on the Boyne Friday morning. From leaving our home in Falmouth we had a stunning but rather windless voyage up to Holyhead and Scotland which gave us time to cruise the Southern hebrides. It feels really very quiet at this time of year, the season is just starting and we have the place to ourselves. Empty anchorages and lochs give us peace and more access to watching wildlife. Just on Jura alone, anchored under the paps of Jura in Loch Tarbert, we had 5 red deer including some 6 point stags, seals and of course the wild Jura goats on the shore. The ancient raised beaches are superbly developed along the coast. They occur as terraces and extensive ‘staircases’ of unvegetated shingle ridges, formed at a time of high relative sea level as the last ice sheet was melting around 15,000 years ago. 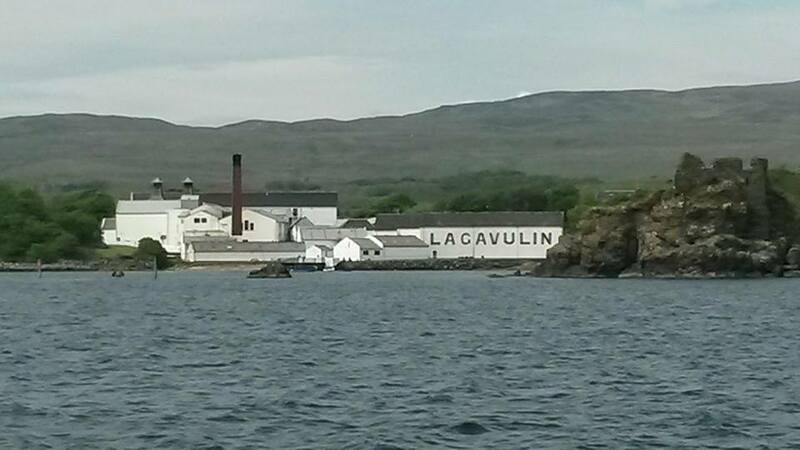 Jura and Islay are two islands close together and world renowned for peated whisky. Of course, it would be rude not to try the single malts, so Bessie Ellen’s guests gathered at Bunnahabain on the shores of the Sound of Islay for a tour of the distillery there. The smell of the peated barley takes over the moment you walk in and you are treated to the site of copper stills and oak vats of enormous proportions, some over 100 years old now all making whisky in a time honoured tradition. 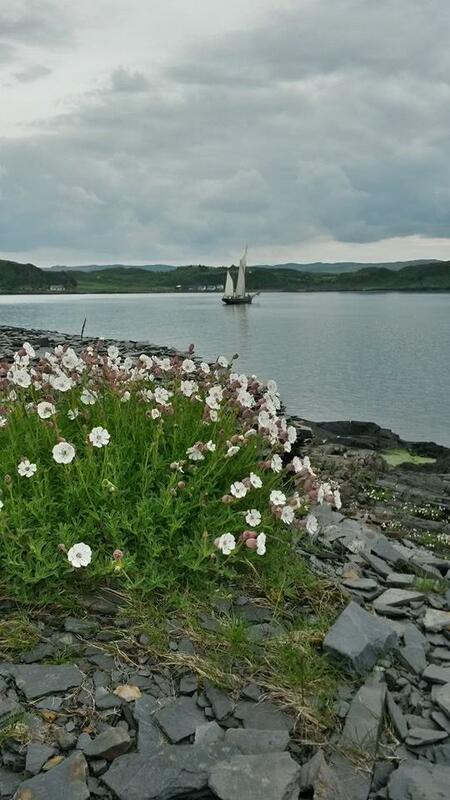 Our love for the water of life was a reason for joining the Feis Ile, a festival of music and malt. Along with our colleagues from the Whisky Lounge, we visited most of the famous names of malt in the week. Port Charlotte was a real find, a perfectly whitewashed small village on the edge of Loch Indaal where one of our guests had a long lost cousin. So after a dram and a present of a Lobster we sailed on towards Port Ellen and the southern coasts where Laphroig, Ardbeg and Lagavulin nestle amongst the rocks distilling some of the finest malts. We were honoured to have a tasting of some tremendous whisky hosted by Colin from Diaggio, an expert in his field who introduced us to Blue cheese with malt whisky, and certainly, it is one to try. As with much of life aboard, food plays an enormous part of our day. 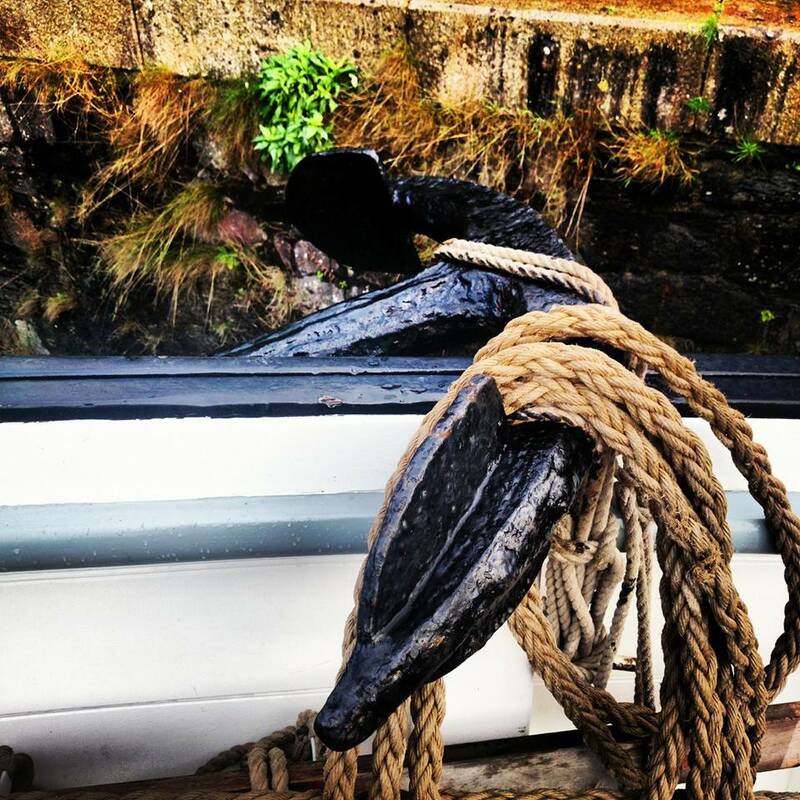 Our time ashore is spent foraging for mussels or sea spinach and the crew set the crab pots for the night. So far, success has been remarkable with a few tins of tinned mackerel. Our last haul from Gometra produced 4 hen crabs, certainly enough for lunch although this lobster was donated earlier in the week. a fanfare welcome and had organised events running all week. Down in the hold, Rum from Dominican Republic, molasses, Grenada chocolate and coffee beans all waiting to be discharged in a European port. Falmouth to Amsterdam and beyond. 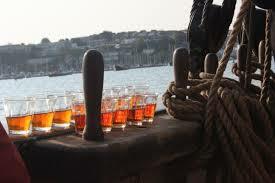 Lucy Gillam from New Dawn Traders has imported the rum into the UK and will continue to ship goods by sail when and where she can. The ship looked great and our crew had a tour given by the crew and captain Lammert. 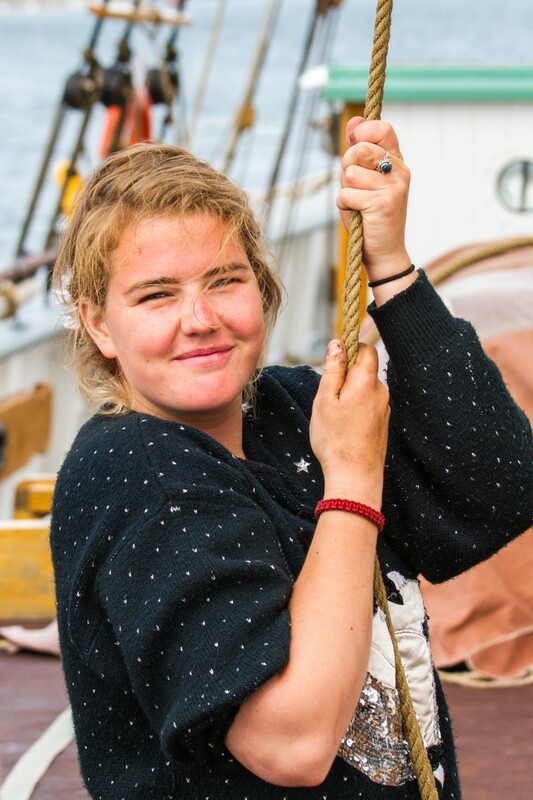 One of our old crew was also on board, Sam from two years ago, now been sailing all winter aboard Tres Hombres. Its wonderful when you get to meet up with old friends and crew wherever you may be but can lead to late nights and headaches. Now it was our turn to really get sailing, and with a pure stroke of luck Easter winds blew us down to Scilly and back. Our welcome there was as good as ever with an alongside berth after Scillonian had left and a visit from Fraser & Becky Hicks who run Sea King from St Mary’s. Although hard hit by the winter gales, there was surprisingly little damage to the islands. Heading Eastwards, we had some great sailing visiting the old cornish harbours of Polperro, Cawsand and Charlestown. Basking sharks have returned early this spring. Numbers were seriously down last year, but on a short stretch of coast from Fowey we say some really large ones. Our guests this week were really game for trying their skills at setting sail and navigating. One lad, Dave who had never sailed before was up and down, sailing off the anchor and just really having the best time. He could not believe how much fun you can have aboard a tall ship and has now applied for deckhand. A special guest also featured this week, Classic Yacht TV were aboard to film an episode about Bessie Ellen and the work we do now to keep our heritage alive. Now, after a short passage, I am sitting in Holyhead marina contemplating the voyage past. After the lovely summery weather all spring, the West wind gods blew up a short gale and Bessie Ellen had to wait for it to pass. Two nights passed before we could attempt Lizard point but the wind was becoming fair later. Bit rough mind, but we finally anchored at midnight for a rest before an early start round Longships and Lands End and away on up towards St George’s Channel. The wind abated and we stormed along under full canvas until the wind died off Milford Haven, so with 50 dolphins in the full moonlight we took it slow up towards Port Dinallaen. Warm sunshine abounded and there was absolutely not a breath of wind to sail so we lay around seeing canvas and varnishing for the afternoon. To end the day, the small pub Ty Coch, opened just for us in the last of the evening sun. Bliss! We have been so lucky last week here in Fowey, Cornwall, spring has really begun with cloudless days, warm sunshine and the woodlands bursting into life beside the ship. Bessie Ellen is lying alongside a pontoon in the river with an old building which was once a pilchard cellar for salting barrels of the silver darlings before shipping to the Mediterranean. Fish cellars were built, away from the town and other settlements, to process and store the fish. The sites were chosen for their ease of accessibility by water. 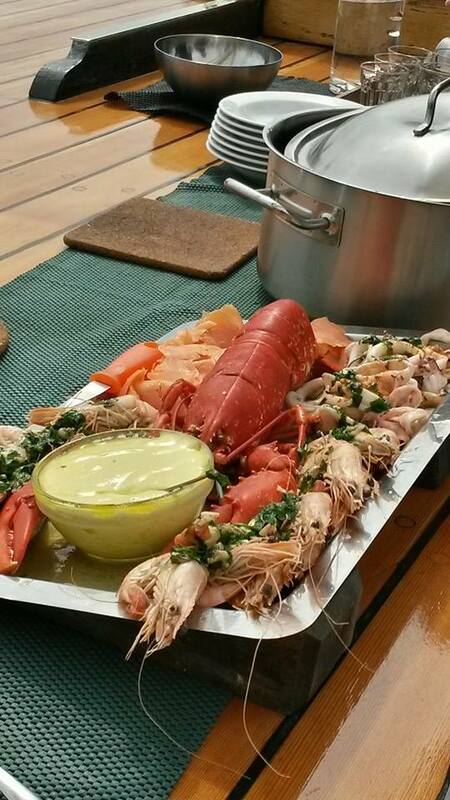 The fish were stacked in the cellars and either pressed into barrels using huge oak beams, smoked or pickled in brine. Another of these cellars was at Brazen Island, and parts of the pits used to collect the fish oil still remain. Its sad the fish are not here in their vast shoals any more, but they are returning slowly and are now fished in a more sustainable method using smaller boats and cotton filament nets. As we work on setting up the new bowsprit rigging of new whisker booms and guys, tarring rigging and varnishing, the air is full of bird noises. Mallard and swans visit for any morsel of bread, the ever present gull and the rather prehistoric cormorants entertain us with their diving and popping up all over the place with beaks full of wriggling eels or small fish. Early afternoon brings the herons as they return back to their nests. Mobbed by gulls, their barks and squawks ring out over the river and just epitomises life on an English river. 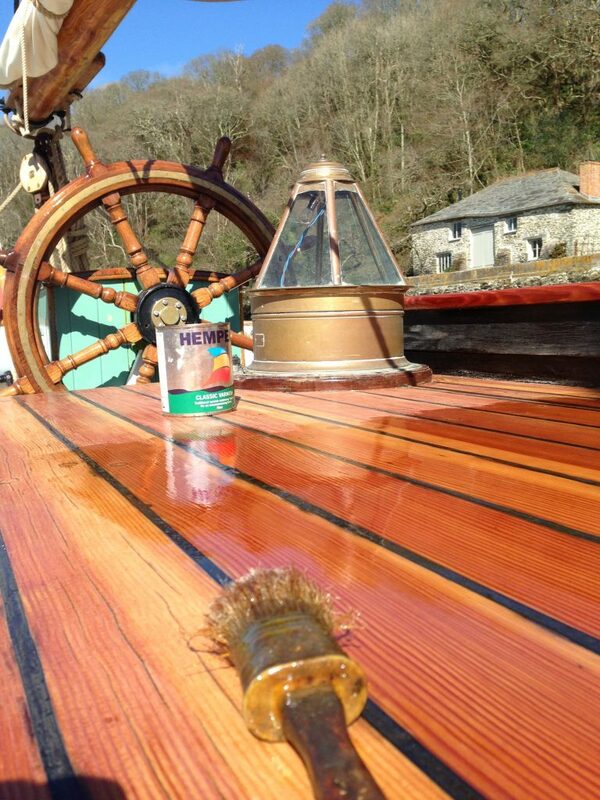 This varnish does not give a huge glossy finish, but is good for our native timbers and lasts well. I must add that it is not so good for tropical oily woods such as teak or mahogany. The aft cabin roof, planked in Douglas fir has a harder, more glossy finish. The choice here is Hempel Classic as all our paint products are Hempel and it keeps things more simple. Hard enough to take the traffic but not great against sun, this area needs to be redone about every four years and takes a good week to strip, sand down and add enough layers to build a shine. This photo shows five coats and we should do at least two more for a good high build. Application of both these varnishes is relatively easy, you need a good quality brush and some natural gum turpentine to make the products flow off the brush and blend a little more easily. A trick I have learned from Denmark is adding a little liquid driers. This really helps in cold or damp conditions which we get in the early evenings at this time of year but does not affect the final finish in any way. If you would like to ask any questions regarding your own varnish projects, then please do get in touch and we can try our best to assist you to reach a perfect finish for your brightwork. Are you interested in birdlife? Then perhaps voyage BE310514 is just what you are looking for. 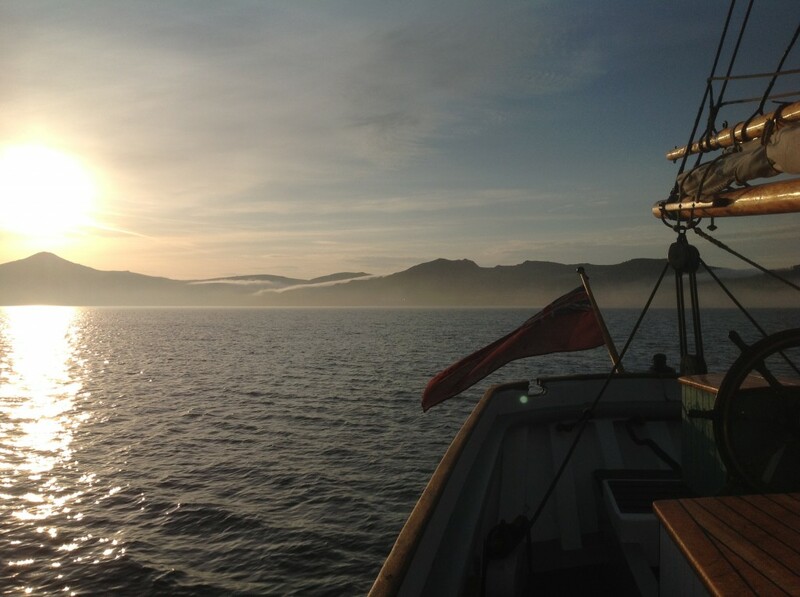 This year we have professional guide Dave Paynter who will join us on this voyage only, for a week of discovering all birds both native and migrants that live here in the western isles of Scotland. Dave has been the Reserve Manager at the Wildfowl and Wetland Trust reserve at Slimbridge in Gloucestershire for over 30 years, as well as the physical management of the reserve he runs an extensive visitor engagement calendar of walks, talks and tours enthusing thousands of visitors with the wildlife that surrounds them. 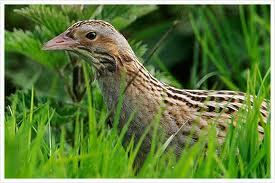 He has extensive knowledge of Waterfowl, Seabirds and Birds of Prey with previous jobs on Skomer Island and Skye; this has also allowed him to develop as a keen botanist and all round naturalist. He has had a lifetime passion for Scotland especially the Western Isles and has travelled extensively there. More recently he has been exploring the area by Sea kayak and in 2011 a big Birthday treat fulfilled a lifetime ambition by introducing him to classic sailing with a voyage on Bessie Ellen. He describes this as probably the very best way of exploring this amazing landscape and seeing its wildlife up close. 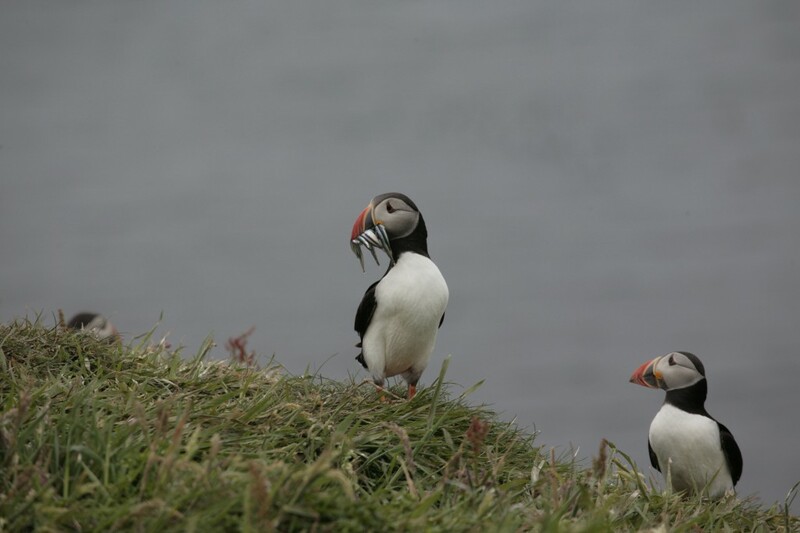 Among the species we are likely to see are: Sea Eagles, Golden Eagle Auks, guillemot and puffin Corncrake Wheatear May is the breeding season, so do make sure that you bring your field glasses to really get involved. We do carry some bird books on board but bring your own if you have a chosen favourite.